I’m a fifth generation Nebraskan, this was my first home and will be my last. 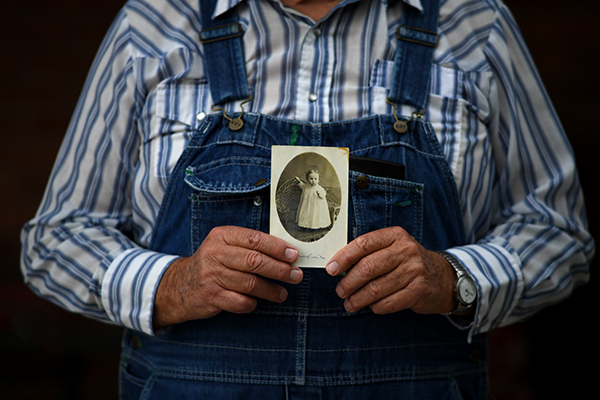 A man in Chadron, NE, holds up a photo of his mother when she was a baby, 103 years ago. She's still with us. I was born in the badlands of the western end of the state. I grew up in the cattle country of the Panhandle. Tyler Messersmith rides across the super moon on his ranch in Lakeside, NE. It’s an American place. It’s big, strong, solid and reliable. There is great beauty in that. Untapped reservoirs of goodness. When you spend your entire life facing a hard wind you learn a different kind of serenity. 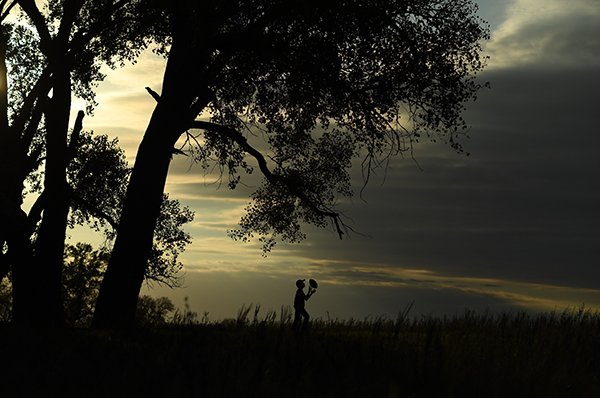 Drew Morrow, great kid and one of my favorite photo subjects, tosses a football in the air on his family's farm. Nebraskans are open and friendly, always willing to extend a helping hand. They draw their power from the land. The land is open, rugged, and beautiful. So are the people. With uncomplicated sight lines, and virtually no pollution you can truly see forever on the plains of the Cornhusker state. There is an exotic component to the simple strength of the safety that envelops you there. It’s my home; physically, spiritually and emotionally. American Bison in the fog of a chilly sunrise at the Crane Trust. When Nikon asked me to produce the first 4K UHD video done with their new flagship camera the D5, my thoughts immediately raced to the land and the people that are always there for me. The state has a big birthday in 2017, it’s 150th. This film is part of my tribute to the place that has meant so much to my family and friends all these years. My friends in Nebraska made this happen. One degree of separation is what you have with the citizenry there. Ninety seconds of solid conversation and I can find a connection with pretty much any person I talk to. The list of kindnesses that were extended to me there warrant a blog post onto itself and that will follow shortly. A few folks merit special thanks here. Katie and Kevin Morrow. Counselors. Hosts. Great friends for life. Kevin and Katie ride a four wheeler on their farm outside O'Neil, NE. Brad Mellema. Nebraska’s ambassador. He knows everybody, gets along with all of them, and proves it. Ted Kirk. One of my best friends. Single greatest resource in the state. Shane Aulick. I’ve known him his whole life. It’s one of those Nebraska things. Shane is a few years younger than me and one of the first scenes I remember was his parents bringing him home from the hospital after he was born. He generously reached out and invited us to shoot ariels from his helicopter. His kindness and skill made a lot of special images possible. From the vantage point he provided, I got to see vistas I’ve known my entire life from a very different perspective. Shane's helicopter with Roy and I inside by Chimney Rock. A sliver moon setting over Scottsbluff, my childhood home. This was taken from Shane's helicopter, moving at 120mph in very low light. This is my fifth flagship camera release for Nikon. Like all of the other cameras before it bearing the Nikon name, the D5 is rugged, reliable, precise, innovative. It delivers more than I could ever hope for. Shooting this piece found us traveling more than 10,000 miles crisscrossing the state. I spent a month sleeping under the stars enjoying those fine summer nights. I felt like I was 10 again—until I had to stand up in the morning. Star trails in the badlands. For all of it Kyle Henderson and Roy Rossovich were there. Providing visual support, enthusiasm, great humor and muscle power. Roy is a terrific shooter and brought a lot to the project. Kyle is the technical one, he makes the time-lapses and motion graphics work. Tricia Coyne joined us for a bit and, as always, made things lively. She is the straw that stirs the drink—and if you don’t get that one, TLC, ask your sportswriter husband. Sara Tanner, our producer. Indispensable. Her southern roots run as deep as my midwestern ones. After almost 10 years together I can almost get her to not call me Sir. Laura Heald. This is as much hers as mine. And like every project we do, none of it would be possible without support from friends across the industry. Chimera light shapers make added light look natural. Their TECH light bank for the litepanel 1x1s were used exhaustively on this trip. Cinevate’s motion control atlas slider is our go to for time-lapse and controlled horizontal movement. The Cinevate atlas 200 slider and motion control takes the D5 for a ride. Manfrotto tripods and video heads give us quality support in all kinds of weather. We rely on Small HD monitors to help us see as well as the cameras do. Bill on set with a Small HD monitor attached to the D5. And no project would be complete without the vast music library at Triple Scoop Music. This is my Nebraska. I hope you enjoy it.